Born into a Showbiz Family whilst travelling with Gandey's Circus, Royle made his stage dﾃｩbut aged 3 and a bit as Flap The Clown with his dad Tizzy The Clown who is also known in the Circus World as "The Amazing Etna" and under which name, he became the Only Speciality Act in the World to ever perform for three consecutive seasons at Belle Vue Circus in Manchester, England with his Fire Eating and Yogi Style Acts. Royle's Dad was decades ago hailed as Britain's (and perhaps the Worlds) Youngest Professional Fire Eater and over the years he of course, as is the tradition in Circus Families, passed down all of his Knowledge and Insights on the subject to his son, the author of this book. How to Run Fire Over your body, How To Blow Balls of Fire Like A Human Volcano, How to Breathe Fire, Other Impressive Tricks With Fire, How to Breathe Smoke Like A Dragon, How to Lye on A Bed of Nails, How to Walk up a Ladder of Daggers, How to Walk on Broken Glass, How To Eat Glass, How To Hammer A Nail into your Face, How to Walk on Hot Coals (Fire), How to Tear a Phone Book into Two and How to Bend a Thick Nail or Metal Wrench with your bare hands amongst other impressive looking Feats. These stunts can be combined together into a complete Act or Show that can be presented in a Serious Manner or In a comical fashion, Royles Dad has done both over the years, and Royle himself preferred a Comedic approach to things. 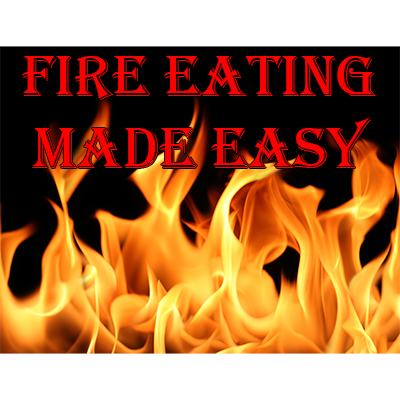 Indeed within the pages of this PDF and by way of the various videos you will be given links to watch, you will learn every element of the 10 to 15 Minutes of Fast Paced Visual and Verbal Comedy that makes up Royles "World Famous Fire Eater" Routine which he has performed in venues all over Europe for well over 20 years to date! He will also reveal 2 other Hilarious Comedy Cabaret Routines which can be combined together with his "World Famous Fire Eater" routine to give you a complete 25 to 30 minute Comedy Variety Act. This would see you being unable to reveal somebody's chosen card with comical results, prior to you paying a forfeit for getting it wrong, namely having to perform a Strip Tease (full of numerous visual gags) for the audience, culminating with the identity of the chosen card being revealed by what is printed on the bum cheeks of your under-pants. This leads perfectly into the "World Famous Fire Eater" Comedy Audience Participation routine and could then easily lead into the Musical Comedy Saw Routine of which you will see video footage by way of the links given within this PDF. As well as learning the Techniques which you can then choose to present in whatever manner suits you best, you will also learn the Comedy Routines mentioned and also be taken back in time with a selection of Press Cuttings and Memorabilia of "The Amazing Etna" and his Fire Eating Act that was featured in many of the biggest Circus Shows and Cabaret Venues in Europe. Purchasers of this PDF should be over the age of 18 and agree that by purchasing they take full responsibility for their own actions and agree that they understand that Fire Eating and the nature of stunts taught in this book and via the included video links are essentially dangerous, so extreme care should be taken at all times and understand that should they act upon anything in this manual, then they do so entirely at their own risk.